one of our colorful vinyl window decals. Only $3.95 ea and FREE SHIPPING! These long lasting colorful computer printed vinyl window decals are 4" x 6" and will adhere to any smooth clean surface, outdoor or indoor use. Choose one style or choose them all - no limit! Only $3.95 ea! Made from UV stabilized exterior grade printed vinyl for long life. Not available anywhere else! Shipping is FREE regardless of the number of vinyl window decals you order. These vinyl decals will be sent to you via USPS Mail, so make sure you enter the appropriate mailing address in the shopping cart. To order one or more of our sunset decals, simply fill in a quantity below the corresponding decal(s) you would like to order, then click the [Add to Cart] button at the bottom of the page. 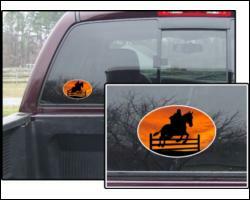 These decals are a closeout item and quantities are limited. We will contact you if we run out of stock of any of the decals you order. They will go fast, so first come, first serve.